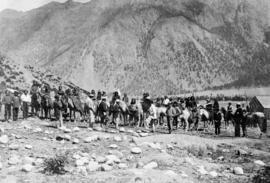 "Governor Seymour addressing a group of Indians at Lillooet." "Well, Bang Goes Another Fine Old Canadian Tradition ... He Never Had A Paper Route..."
"Try To Remember, Adrian... "
"Daddy's gonna get you a bigger buggy... "
"My visit to the Legislature." "Come Along Now, Henry--What Do You Know About Politics?" "I expect this session to be a quiet one... "
Legislative Assembly of BC, Victoria. BC Members of the House of Commons, Elected 1891; composite photo. 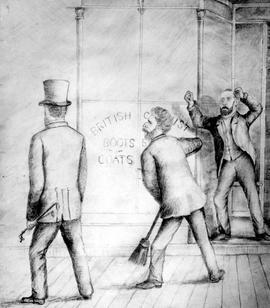 Political cartoon from the cover of the Montreal "Canadian Illustrated News"; "Pacific Railway Falconry". Greenwood city council, on the occasion of the coronation of King George VI. Governor General, the Earl of Aberdeen, 1893 to 1898. The Right Honourable Robert Laird Borden, K.C. Honourable John Patton Booth, Speaker, 1898 - 1902. The Honourable Premier Harlan Carey Brewster. Richard Blanshard; first Governor of Vancouver Island. The Honourable Edgar Dewdney, Lieutenant Governor from 1892 to 1897. The Honourable Clement Francis Cornwall, Lieutenant Governor 1881 to 1887. The Honourable Theodore Davie, Premier.